Today I am pleased to have an interview with author Sue Johnson. I am particularly pleased to have Sue on my blog on the occasion of the launch of her debut novel, as I have been attending her writing courses for a couple of years now. 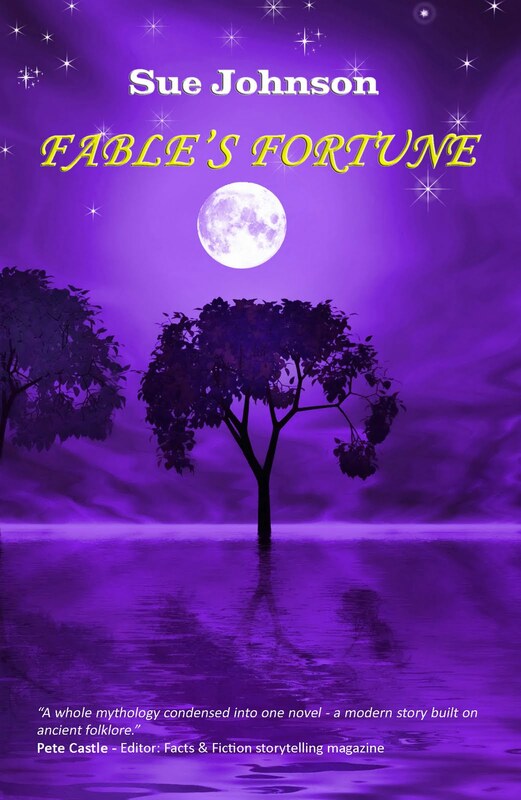 Fable’s Fortune is released by Indigo Dreams Publishing on 1 August and can be ordered from their website or from Amazon. It is described as a modern day fairytale. Fable Mitchell is born under a roof of stars in a Kentish plum orchard, and her early childhood is spent in a house called ‘Starlight’ where she lives with her mother Jasmine and Gangan the Wise Woman. However, her life is not destined to remain like a fairytale. When she is ten, she is abducted by her estranged father Derek, now a vicar, and taken to live in his austere vicarage at Isbourne on the banks of the River Avon. Fable is unable to escape. When she is sixteen, she falls in love with Tobias Latimer but he dies in mysterious circumstances and Fable’s happiness is once again snatched away from her. She tries to rebuild her life and marries Tony Lucas because she thinks the omens are right. Fable soon realises he is abusive and controlling, but is trapped because she fears losing contact with her daughter. Nearing her 40th birthday, Fable hears Gangan the Wise Woman’s voice telling her to ‘be ready – magic happens.’ This is certainly true, but does Fable have the necessary courage to finally seize her chance of lasting happiness? Born in Kent, Sue Johnson, has had a variety of jobs during her working life including training administrator, vicar’s secretary, cinema usherette and at one time ran her own patchwork quilt-making business. She is now a writer, artist and musician and most of her work is inspired by the stunning Worcestershire countryside where she currently lives. She is a Writers’ News Home Study Tutor and runs writing courses. 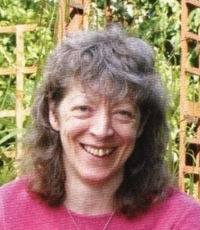 Short stories written by Sue have appeared in Woman, My Weekly, Woman’s Weekly, Chat, Take a Break and People’s Friend. She is published as a poet; including a joint collection with her partner Bob Woodroofe entitled ‘Tales of Trees’. I asked Sue a few questions about herself and the book. Even before I could write, I used to tell stories to my dolls and teddies. I can vividly remember ‘that’ lesson at school when they ask you what you want to be when you grow up and I said I wanted to write stories and draw pictures. The teacher said: “I don’t think that’s a proper job do you dear? – you’d better write about being a nurse.” (I had an aunt who was a medical secretary). I must have done a good job because she put the story on the wall – but I can remember feeling cheated. Fortunately, the next teacher was a lot more encouraging and she used to leave me writing stories a mile long while the other children went off and did other things. What was the inspiration for Fable’s Fortune? ‘Fable’s Fortune’ began life as a piece of autobiography – 85,000 words of it! I’d just gone through a divorce and I wrote the first draft (back in 1998) as a form of therapy. I then went back to college and didn’t touch it for a long time – but by then the characters had grown and developed inside my head and had moved a long way from their origins. The magic and fantasy/storytelling elements crept in more and more with each redrafting. I know there is an interesting story behind the naming of your character. Would you share it with us? Fable was originally called Rose – which is half of my middle name. Then when I reached draft four or five of the book she suddenly started saying she wanted a different name. I looked in every book I could think of for inspiration but none came. In the end I decided to ask my guides/angels/fate to sort the problem. I put on my jacket (it was winter time) and walked into Pershore intending to buy a coffee in the first café I came to – and then listen out for the first woman’s name I heard. (This is something that has worked for me in the past). Two elderly women came in – complete with fur coats and wicker shopping baskets. “Of course, my daughter Fable…” began one of them as they sat down. I finished my coffee and raced home! Don’t be discouraged by negative criticism. Learn to trust your own judgement and stick with a piece of work if you like it. Don’t be put off by rejection. We all get them. Keep going until you’re successful. Finally, could you tell us something about your new release ‘Fable’s Fortune’? When the email from Indigo Dreams popped into my inbox last October saying that they wanted to publish my book, I was so sure it was going to be another rejection that I didn’t open the email until I’d sorted out details of the next publisher on my list. When I finally opened the email I let out such a loud yell and leapt up in the air that the friends I had staying with me raced up the stairs thinking I’d injured myself! Copies can be ordered from any bookshop, Amazon, Indigo Dreams or Central Books. Gangan opened the front door letting in a chilly blast of frosty air and a skitter of dry leaves. Jasmine wasn’t there. A brick struck the corner of the house and ricocheted off into a blackened clump of dahlias in the garden next door. I gazed into the darkness, suddenly noticing the semi-circle of women standing in the road outside our house. Mrs Cameron was the first in line with Marge Henderson next to her. None of them were dressed for a fight and must’ve been frozen in their pinafores and thin shoes. Gangan took no notice of the women. She peered into the gloom shouting for Jasmine. “Murderer,” shouted Marge Henderson throwing a half-brick that fell short of our gate, skidding along the icy road. The women stepped forward, moving unsteadily on the ice before being scattered like skittles as a black Morris Oxford turned into our street, headlights blazing. I wish Sue every success with ‘Fable’s Fortune’. For those of you local to Pershore, Worcestershire, Sue is signing books at Number 8 Community Arts Centre, Pershore on Saturday 6th August from 2.30 p.m. Also on Friday 19th August at 2.30 I am doing a talk in Pershore Library on ‘A Novel’s Journey.’ Admission is free and includes afternoon tea. Find Sue on Facebook and Twitter @SueJohnson9. Her blog is The Writers Toolkit. What a great interview and Fable's Fortune sounds very interesting. Another book for my to be read pile 🙂 Thanks Morton and wishing you zillions of sale Sue…. good luck! Yes I would echo Pauline's comments – always good to have a recommendation re TBR pile! This is a really interesting interview. Well done. Best wishes to Sue on her book release. Thank you for the comments. Just finished reading Fable's Fortune. I wasn't sure I was going to like it to start with but then it got me hooked and I couldn't stop reading. My heart was in my mouth at several points and I will admit to shedding tears. Sue has a very different writing voice, which if you know her is just like her speaking to you. Very enjoyable and I wish her every success with it.